I recently returned from 5th Annual PCI Security Standards Council vendor expo in Scottsdale, AZ. And rather than returning with a sunburn - after all it was 106 degrees there - I returned with a much better appreciation of what companies are doing to help protect cardholder data. Every major company that accepts credit cards was at this event. As a consumer at many of these companies, it made me feel good to know that they take this job seriously and are doing everything they can to keep my information and all of their customers’ information secure. This was my first time at the event and I enjoyed meeting new people and learned a lot of interesting things. I met with QSA audtiors, customers, potential customers and vendors. When asked who Townsend Security was, I recited my elevator pitch and said “we provide certified encryption and key management solutions to help mid-market customers meet compliance requirements.” That message was well received, however, as the expo continued, I discovered that people “get” encryption and were more interested in discussing encryption key management. Many knew key management was something they needed to do and for those that said they were doing something, they wanted to know how they could automate the process. We know encryption key management isn’t easy, but it is necessary for compliance and to be honest, it is really a best practice for protecting data. If you are going to go through all the work of encrypting data, then you really should make sure the keys safeguarding the data are also secure. I talked a lot about our encryption key management solution, Alliance Key Manager (Enterprise and SQL Server editions), at the Expo and thought it would be worth recapping some of the discussion for those who couldn’t be there and are facing encryption key management requirements of PCI DSS. 1) Manage and store encryption keys on a certified appliance. Our encryption key management solution ensures encryption keys are stored away from the encrypted data, it allows you to satisfy PCI requirements for dual control and separation of duties. QSA auditors will look to make sure the same person who has access to encrypted data doesn’t have access to encryption keys (dual control). It is important to restrict access to certain keys by certain users or groups (separation of duties). You don’t want the same person who has access to encrypted data to have have access to keys that unlock that data. 2) Rotate encryption keys. PCI DSS states that you need to periodically rotate the encryption key. This can be a very time consuming task if done manually and may even be overlooked because it can be a very complex project, depending upon your encryption code. Our encryption key management solution allows you to schedule regular key rotations and enforce your internal security policies while meeting PCI requirements. 3) Log all encryption key activity. Alliance Key Manager has built in logging, which allows administrators to track all key retrieval, management, and system activity. Reports can be sent automatically to central log management, alerting facilities, or SIEM products for a timely and permanent record of activity. 4) Certification. Our encryption key management solution is FIPS 140-2 Level 1 certified, ensuring you are effectively managing keys to industry standards. 5) Don’t let cost be a barrier to meeting compliance requirements. If you have looked at key management solutions, you know they can be costly. Alliance Key Manager (enterprise and SQL Server editions) are priced with the mid-market customer in mind. I think this was the fact that resonated with people I spoke with the most. They were happy to hear about a solution that is easy to implement, as well as cost-effective. We handed out this useful PCI DSS and Key Management matrix at the conference, several people found it useful. 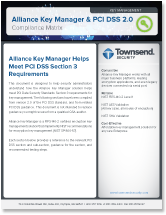 Download your copy to learn more about key management requirements. And if your company knows you need an encryption key management solution, give us a call. We are happy to spend a 15-minute technical overview with you and your team to find out how we can help you. Today the Payment Card Industry Security Standards Council issued some long awaited guidance on tokenization as a method of protecting credit card information (“PAN”, or Primary Account Number in PCI language). This guidance has taken a number of months to produce, and will be very helpful to merchants who want to deploy tokenization solutions to reduce the scope of PCI compliance efforts, for those who have already deployed solutions and need to assess if they meet minimum requirements, and for QSA auditors who have been looking for some guidance in this area. The link to the guidance is here. Here are some first thoughts on reading the guidance. As I’ve been saying here before, a tokenization solution is always in scope for PCI DSS compliance. This means the merchant is responsible for insuring that a tokenization solution itself meets all of the PCI DSS requirements. Whether you create your own tokenization application, or you acquire one from a vendor, it is in scope for PCI DSS compliance and you are responsible for it. The guidance makes this point very clearly. In fact, the guidance makes the observation that tokenization solutions are likely to be the targets of attack because they become a centralized repository of credit card information. Merchants should be very careful that their tokenization solutions meet all PCI DSS requirements and are sufficiently hardened. In my opinion, there are very few merchants who would be up to the task of creating such a solution in-house. Following on the previous point, a tokenization solution must have encryption and key management capabilities that meet PCI DSS requirements. This means special care in the deployment and implementation of key management. You should be very sure that your key management solution implements proper Dual Control, Separation of Duties, Split Knowledge, and separation of keys from protected data. When acquiring a vendor solution for tokenization look for FIPS-140-2 certification of the key management system – that should be a minimum requirement to indicate the proper implementation of encryption and controls. Download a recent webcast I recorded that discusses the importance of tokenization and PCI compliance. Today’s announcement by the PCI Security Standards Council on tokenization is certain to raise awareness about the importance of selecting the right tokenization solution for your organization and ensuring it meets the PCI DSS requirements. I will be post another article Tuesday that will discuss more thoughts on this new guidance.